The Pharmacokinetics (PK)/Bioanalytics Core Facility provides bioanalytical and pharmacokinetic support for the research groups and associated clinical trials within the institute thus providing a bridge between the laboratory and clinic. Pharmacokinetics (PK) is the study of what the body does to drugs. It is the mathematical study and description of the absorption, distribution, metabolism and excretion processes used by the body when a drug is administered. In order to obtain good PK data, bioanalysis forms an integral part of the process as it is essential to accurately quantify levels of drug in the body over a period of time. 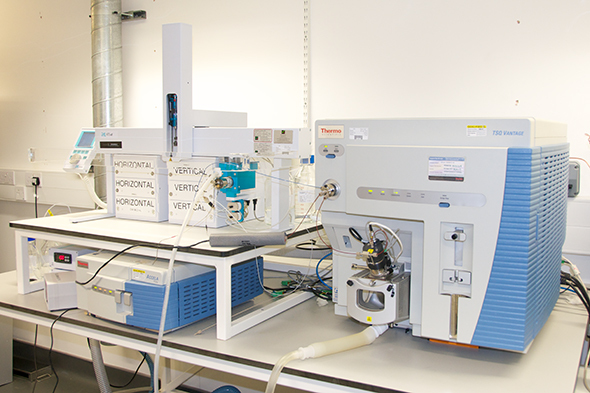 The PK/B Core Facility currently specialises in the quantitative analysis of small molecules such as drugs, biomarkers, metabolites and other analytes (between 50 and 2000 atomic mass units) from biological samples. To facilitate bioanalysis there are two liquid chromatography triple quadrapole mass spectrometry (LC-MS/MS) systems within the facility. These state of the art systems are capable of quantifying very low levels of analytes in a variety of biological matrices such as blood, plasma, urine, tumour and cell lines. The Core Facility supports a number of research projects at the CI ranging from small molecular biomarkers, endogenous metabolites, epigenetics to novel and current therapeutic drugs; this forms the non-regulated aspect of the PK/B Core Facility where assays are performed on research and non-clinical trial samples. To support clinical trials, the regulated work the Core Facility performs includes the validation of assays and the analyses on samples from clinical trials. As the clinical trials are regulated by the Medicines and Health Regulatory Authority (MHRA), the PK/B Core Facility complies with the guidelines for Good Clinical Practice for the Clinical Laboratory (often abbreviated to GCP (L)). For pharmacokinetic analysis, the Core Facility has Certara Phoenix (formerly Pharsight WinNonLin®) software, the industry standard software for compartmental and non-compartmental PK analysis. Phoenix® also has the capability to simulate the time-concentration profile to establish the effect of changing dose, dose schedule or dose route. The Core Facility also provides technical and scientific advice on study design ranging from simple PK studies to in vivo efficacy studies. Early discussion is crucial to ensure that maximum benefit from the facility’s services can be obtained.